Don’t you hate when you try a dish from a new cuisine and you always end up ordering the same one every time? That’s me with Peruvian food. I was first introduced to Lomo Saltado, a classic Peruvian-style stir-fry of steak and onions (and sometimes bell peppers), a few years ago while at a food truck festival. Today, although I have sampled various Peruvian dishes, such as ceviche mixto, tallarin verde, etc., I will always still order the Lomo Saltado. It vaguely reminds me of the steak picado my mother would make on the fly. However, her picado never had the layers of flavoring that this dish embodies. The influence of Asian immigrants in South America, especially Peru, comes through in this dish marinated in rice vinegar, soy sauce, and oyster sauce. If you can, take the time to marinate the beef overnight. For this recipe, the secret ingredient I added was Chef Merito Fajitas seasoning that rounded out the flavors nicely. The seasoning and marinade company sent us a basket of products to celebrate its involvement with the family-friendly Viva Los Dodgers Games this summer. 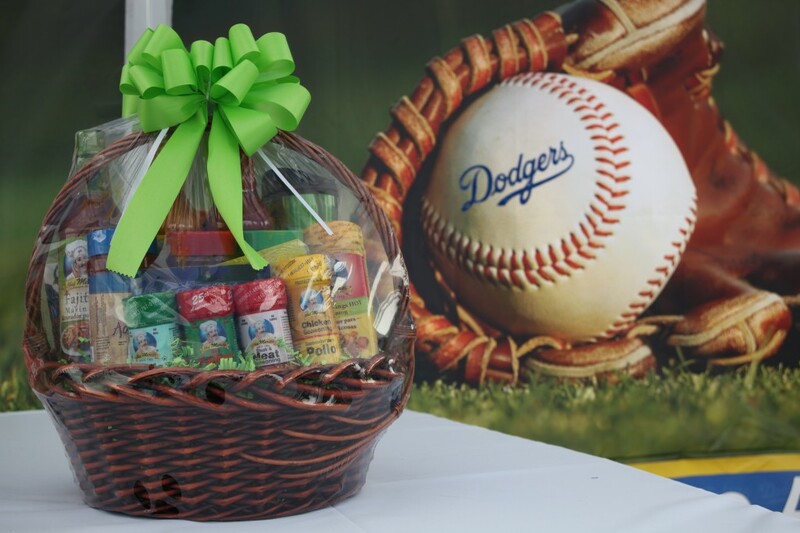 See below for information on how you can win your very own Chef Merito product basket (Deadline is Monday, July 1) and learn more about the fiestas at the baseball games. We love Chef Merito seasoning and marinades for our carne asada, chicken, and seafood. 1. To make the marinade, finely chop the garlic clove, sprinkle with the salt, and mash the mixture together with the flat side of a chef’s knife. Continue to mash and chop until the mixture is a paste. Scrape the paste into a medium bowl and whisk in the canola oil, rice vinegar, soy sauce, oyster sauce, cumin, Chef Merito Fajita Seasoning, pepper, and paprika. Add the beef, turn to coat in the marinade, cover the bowl with plastic wrap, and refrigerate for at least 2 hours or overnight. 2. To make the lomo saltado, heat the olive oil in a large work or heavy skillet over high heat. Once the oil starts to smoke, add the steak and onions and cook, stirring often, for one minute. Stir in the cherry tomatoes, shallots, and garlic and cook, stirring often, until the tomatoes begin to soften, about four minutes. 3. Carefully pour in the red wine, soy sauce, and honey and cook until the sauce has slightly thickened, about 4-5 minutes. Stir in the chopped cilantro. Cook for 2 minutes longer to bring the flavors together and then turn off the heat. Garnish and serve immediately. Note — One of my favorite ways of eating the Lomo Saltado is with white rice and/or thick cut french fries. For a healthier option, think about substituting the white rice with brown rice and the french fries for baked sweet potato fries. It’s all good! Viva Los Dodgers is a season-long series of family-friendly events celebrating Latino culture in Los Angeles. 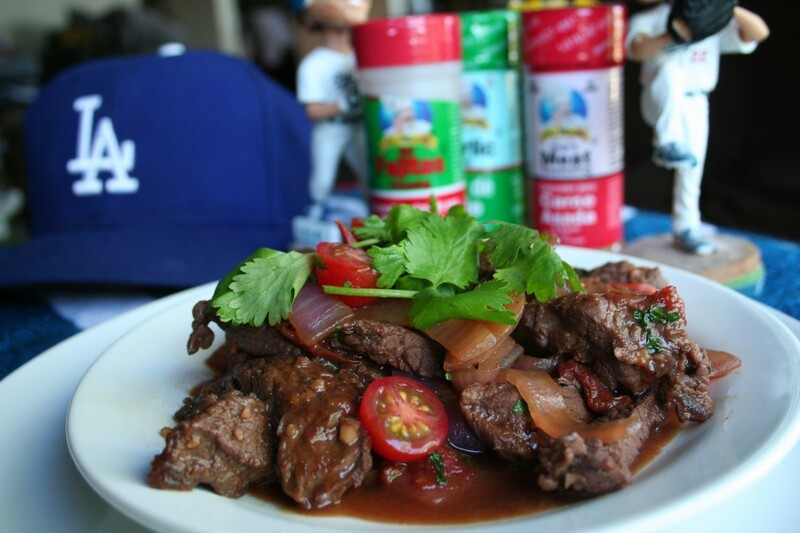 Chef Merito is the official seasoning of the Los Angeles Dodgers and a sponsor of the Viva Los Dodgers initiative. Chef Merito will be on hand at every Viva Los Dodgers event to serve mouth-watering carne asada tacos to thousands of Dodger fans. The family-friendly pregame festival is held in lot 6 two hours prior to each Sunday’s home game and is free with a Dodger game ticket for each Sunday game. Fans can enjoy live music and family-friendly activities. To win a Chef Merito basket of seasonings and marinades, all you have to do is leave a comment on this post and “LIKE” Chef Merito on Facebook https://www.facebook.comChefMerito and follow Chef Merito on Twitter @ChefMerito. 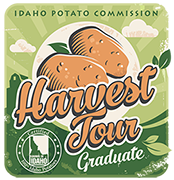 Deadline to enter is Monday, July 1 at 5 p.m. PST. This is part of a supported campaign with Chef Merito; however, all opinions expressed are my own.